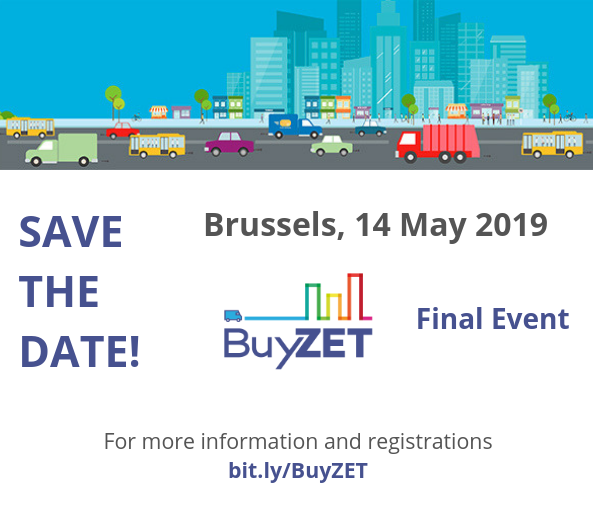 The BuyZET project is glad to announce that the BuyZET final event will take place on 14 May 2019 in Brussels. In CIVITAS BuyZET, three cities (Copenhagen, Rotterdam and Oslo) are testing new smart procurement approaches to influence the transportation footprint of purchased services, goods and vehicles. These are concrete actions needed to achieve CO2-free city logistics by 2030, one of the main objectives of the European Commission Transport White Paper of 2011. The event will be an opportunity to discover and discuss the tools and recommendations developed by BuyZET. In addition, the event will also look at the new rules for the public procurement of clean vehicles in the revision of the Clean Vehicles Directive. More information on speakers, sessions and exhibition will follow soon. Attendance is free of charge. Register here by Monday 6 May! Are you a public authority and you would like to attend? Contact us (Giacomo Lozzi, glozzi@polisnetwork.eu) - it might be possible to reimburse your travel costs.